Alpes-Maritimes (French pronunciation: ​[alp ma'ʁitim]; Occitan: Aups Maritims; Italian: Alpi Marittime, "Maritime Alps") is a department of France located in the extreme southeast corner of the country, near the border with Italy and on the Mediterranean coast. Part of the Provence-Alpes-Côte d'Azur region, it had a population of 1,080,771 in 2013. It has become in recent years one of the world's most attractive destinations, featuring cities such as Nice (prefecture), Cannes, Antibes and Grasse, and numerous alpine ski resorts. Alpes-Maritimes also entirely surrounds Monaco. The department's inhabitants are called Maralpins and Maralpines; it has the same flag and arms as the City of Nice. The Alpes-Maritimes department is surrounded by the departments of Var in the southwest, Alpes-de-Haute-Provence in the northwest, Italy, and the Mediterranean Sea to the south. It surrounds the Principality of Monaco on the west, north and east. Its topography is very mixed. As its name suggests, most of the department is a constituent part of the overall topographic Alps – including the Maritime Alps – but it also has the distinction of being a coastal district with its Mediterranean coast. The coastal area, urbanized and densely populated (shaded in red on the map), includes all the cities in an almost continuous conurbation from Cannes to Menton, while the larger but sparsely populated mountainous area (light green) is fully rural with the exception of the three large resorts of Valberg (created in 1936), Auron (created in 1937), and Isola 2000 (created in 1971). The highest point of the department is the Cime du Gélas (3143 m) on the Franco-Italian border which dominates the Vallée des Merveilles further east. In fact the summit of Monte Argentera is certainly higher at 3297 m above sea level but it is located in Italian territory. There is also Mount Mounier (2817 m) which dominates the south of the vast Dôme de Barrot which is formed of a mass of more than 900 m thick red mudstones deeply indented by the gorges of Daluis and Cians. Except in winter, four passes allow passage to the north of the Mercantour/Argentera mountain range whose imposing 62 km long barrier covered in winter snow which is visible from the coast. From the west the Route des Grandes Alpes enters the Cayolle Pass (2326 m) first on the way to the Alps and the sources of the Var in the commune of Entraunes. Then the route follows the Col de la Bonette – the highest pass in Europe at 2715 m – to connect to the valley of the Tinée then the Ubaye. Further east, the Lombard pass (2350 m) above Isola 2000 allows access to the shrine of Saint-Anne de Vinadio in Italy. Finally, at its eastern end, the Col de Tende (1871 m) links with Cuneo in Italy. The only region of the Alps close to Nice has an afforestation rate of 60.9%, slightly higher than the average of the department and well above the average of 39.4% for the Provence-Alpes-Côte d'Azur region. It is the climate that made the Côte d'Azur famous. The current department of Alpes-Maritimes, however, does not have only one climate, the complex terrain and high mountains divide the department between those who are well exposed (the south-facing side) and those which are less (the north-facing side) and even with the mild Mediterranean climate there can be violent storms and prolonged droughts. The coastal area has a Mediterranean climate (rainfall in autumn and spring especially, summer drought, mild winter and dry). Towards the interior, especially in the north, a mountain climate (winter quite bright, summer storms). One of the attractions of the department is its level of sunshine: 300 days per year. Despite this the department is also the most stormy of France with an average of 70 to 110 thunderstorm days per year. Department map showing its division into the two arrondissements and the location of some of its principal cities and towns. 27 cantons and 163 communes. Urban community of Nice Côte d'Azur. Alpes Maritimae was created by Octavian as a Roman military district called maritimae Alps in 14BC, and became a full Roman province in the middle of the 1st century AD with its capital first at Cemenelum (today Cimiez, a suburb north of Nice) and subsequently at Embrun. At its greatest extent in AD 297, the province reached north to Digne and Briançon. Nice, cantons: Nice (2 cantons), Aspremont, La Brigue, Menton, Monaco, Roquebillière, Saint-Sauveur-sur-Tinée, Saorge, L'Escarène, Sospel, Utelle and Villefranche-sur-Mer. Sanremo, cantons: Sanremo, Bordighera, Dolceacqua, Pigna, Taggia, Triora and Ventimiglia. Puget-Théniers, cantons: Puget-Théniers, Beuil, Gilette, Guillaumes, Roquesteron, Saint-Étienne-de-Tinée and Villars-sur-Var. Its population in 1812 was 131,266, and its area was 322,674 hectares. The department was reconstituted in 1860 when the county of Nice was annexed by France. It included the county of Nice as well as the previously (at least nominally) independent towns of Menton and Roquebrune, and the arrondissement of Grasse in the department of Var. In 1860 Camillo Benso, Count of Cavour, one of the architects of Italian unity with the kingdom of Piedmont-Sardinia, negotiated support for Napoleon III in exchange for Savoy and the County of Nice. The annexation was confirmed on 15 and 16 April 1860 by 30,712 male electors enrolled in the 89 communes of the County of Nice who, for the first time, had universal male suffrage by plebiscite. The "Yes" vote for reunification with France was 83.8% of registered voters and 99.2% of votes. The new department of Alpes-Maritimes consisted of the former County of Nice, divided into an Arrondissement of Nice and an Arrondissement of Puget-Théniers (both arrondissements existed in the former Department (1793–1814)), and a portion of the Var department which formed the Arrondissement of Grasse. However, the County of Nice did not include Tende and La Brigue which were incorporated into France in the Treaty of Paris in 1947. The Arrondissement of Puget-Théniers was removed for purposes of economy in 1926 and attached to Nice: the department has not since had two districts. In 1947, in accordance with the Treaty of Paris and as a referendum result favourable to their attachment to France, the communes of Tende and La Brigue (also parts of communes in the high valleys of Vésubie and Tinée: part the commune of Isola) which had been Italian since 1860, were attached to the department. Argent, an eagle crowned of gules displayed with wings inverted, on a mountain of three hillocks sable issuant from the pointed waves of a sea azure waved in argent. The economy of the Alpes-Maritimes is characterized by the importance of the tertiary sector. The department has, in addition to tourism and traditional services, a relatively high level of corporate research and higher level of services. Agriculture is of little importance and industry plays a relatively small role although it has diversified into activities with high technological value. The construction and public works sector is quite important. The economy is very sensitive to changes in the national and international situation. The rate of unemployment is 9.1%. According to the INSEE, in 2005 the GDP per capita of the Alpes-Maritimes was 27,723 euros which ranked it as the thirteenth highest department in France. GDP was 29.6 billion euros. According to Eurostat, GDP per capita at market prices in 2008, the department had a GDP per capita of 30,700 euros, which is also ranked it thirteenth in France. Tourism is an essential industry for the entire coastal region (Côte d'Azur) and is highly developed (Nice is the fifth largest city in France). Thanks to the mild climate this is a resort town all year round. In the mountains, there are also some winter sports stations that have received abundant snow in recent years (particularly Isola 2000). There are also well-developed industries such as the perfumery in Grasse, new technologies from Sophia-Antipolis and the aerospace industry in Cannes where there is the first European satellite builders and the first industrial plant in the department. The department has 222 nursery schools, 357 primary schools and one special school. It also hosts 72 colleges, 14 vocational schools and 22 high schools, to which must be added 65 private schools. Related article: University of Nice Sophia-Antipolis. Higher education is relatively underdeveloped in the department. The urban area of Nice has 35,000 students, while Rennes and Bordeaux each have 60,000. Alpes-Maritimes benefit from the installation at Menton since October 2005 – the first stage of Sciences Po – which is dedicated to the relationship between the northern and southern shores of the Mediterranean and the relationship of Europe with the Middle East. There are also INRIA and CNRS in Sophia Antipolis. 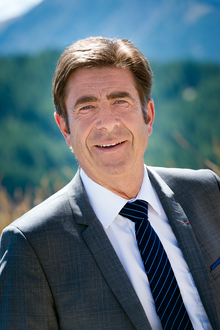 Charles-Ange Ginésy has been President of the Alpes-Maritimes Departmental Council since 2017. Constituencies of Alpes-Maritimes for the National Assembly of France. Blue: The Republicans. Yellow: La République En Marche! Since the Second World War, the department has voted to the right. 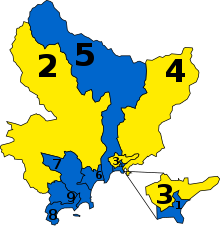 It has nine constituencies for the National Assembly. Following the legislative election of 2017 six constituencies are represented by members of The Republicans (LR) right-wing party and three by the centrist La République En Marche! (REM) party. Of the five Senators representing the department in the Senate, four are right-wing (LR) and one is left-wing (Socialist Party, PS). Of the fifty-two departmental councilors, forty-two are right and ten are left. Alpes-Maritimes has experienced problems of corruption in its politicians in the 1980s and 1990s which led to criminal convictions including the Mayors of Nice (Jacques Médecin), Cannes (Michel Mouillot) and Antibes (Pierre Merli). The President of the Departmental Council is Charles-Ange Ginésy who succeeded Éric Ciotti in 2017. Both are members of The Republicans (LR) party. The LR majority in the departmental council is one of the largest majorities in any such institution in France. Alpes-Maritimes's 2nd constituency Loîc Dombreval La République En Marche! Alpes-Maritimes's 3rd constituency Cédric Roussel La République En Marche! Alpes-Maritimes's 4th constituency Alexandra Valetta-Ardisson La République En Marche! In 2011, the draft departmental budget amounted to €1.3 billion of which 498 million (38.3%) was devoted to social action and 346 million to operations (26.6%). Capital expenditures was just over 250 million euros (19.2%). In 2010, the department was the third most indebted in France with €942 million of debt or 68.4% of the annual budget. This debt amounted to 2,460 euros per fiscal tax unit (household) and 859 euros per person. The trend of change in debt over the last decade has been a sharp increase: + 440% between 2001 and 2009 and 26% between 2009 and 2010. There was only €43 million in debt in 2003. The Alpes-Maritimes Departmental Council has charged 1 euro per vehicle journey in the department, regardless of distance, since 1 January 2008. When Nice became part of France in 1860, it was still a small town; the department had fewer than 200,000 inhabitants. However, the population grew quickly from 300,000 at the beginning of the 20th century to over a million. The population is aging because of the number of retirees who move to the coast. The population is now concentrated in the urban region that includes Antibes, Cannes, Grasse, Nice, and Menton, and which constitutes 90% of the total population. The department had 1,079,100 inhabitants in 2009, making it the nineteenth most populated department in France. 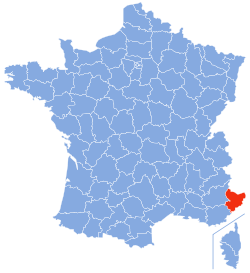 There are 163 communes including 106 under 2000 inhabitants (representing a total of 55,219 inhabitants), 38 from 2000 to 9999 inhabitants (total 158,373 inhabitants), 15 between 10,000 and 49,999 inhabitants (total 323,829 inhabitants), 3 between 50,000 and 199,999 inhabitants (Antibes, Cannes, and Grasse, total 200,944 inhabitants), and one of 340,735 inhabitants (Nice). The Population density rose to 251 inhabitants per square kilometre in 2009. According to INSEE 39.5% of children born in 2011 in the department of Alpes-Maritimes have at least one parent born abroad (regardless of nationality), 15.4% have a father born in North Africa. The area is also known for its extremely large population of people of Italian descent. About 40% of the population of the Alpes-Maritimes claim their ancestry as being solely Italian, and as many as 80% of the population can trace some degree of ancestry back to Italy before it was annexed by France in the 1860s. Cultural life is rich and fully described in the daily regional Nice-Matin and announced in the weekly supplement JV Wednesday. This is not classic, an annual event for classical music, created by the General Council of the Alpes-Maritimes in 2005. It takes place at the Acropolis convention centre in Nice and occupies all available rooms beginning with the large auditorium seating 2,400 people. The French Riviera, centred on Nice, attracts millions of tourists every year. The presence of the Mediterranean Sea and the French Alps under a mild sky has favoured one dominant activity: tourism which accounts for 64,000 jobs directly in the Alpes-Maritimes. For only the city of Nice the tourism turnover represents a 12 to 13% share of the whole tourism market in France. The capital of the French Riviera is the sixth most populous city in France. The city of Nice also has the second largest airport in France (Nice Côte d'Azur Airport) after Paris and its three airports at Roissy, Orly and Le Bourget. There are nearly 13.5 million passengers per year passing through Nice Airport. The area inland from the busy French Riviera is an excellent base for many outdoor sports: cycling, mountain biking, skiing, walking, rock climbing, canyoning, canoeing, rafting, fishing, horse riding, Adventure parks, caving and the area has the first ever underground via ferrata. The area has internationally renowned paragliding and hang gliding flying sites at Col-de-Bleyne, Gourdon, Gréolières and Lachens. In the mountains, skiing and hiking bring life to Saint-Étienne-de-Tinée (Auron), Beuil, Péone (Valberg), Saint-Martin-Vésubie, Isola, Gréolières, Peïra-Cava, Col de Turini, and Turini-Camp d'argent in the Authion mountains. According to the general census of the population on 1 January 2008, 23.2% of available housing in the department were second homes. The asteroid 100122 Alpes Maritimes is named in the département's honour, on the occasion of the thousandth discovery made from its territory. ^ "Charles-Ange Ginésy est le nouveau président du conseil départemental des Alpes-Maritimes". francetvinfo.fr. Retrieved 28 March 2018. ^ Legal Populations 2009, INSEE. Consulted on 14 July 2012. Wikivoyage has a travel guide for Alpes-Maritimes.